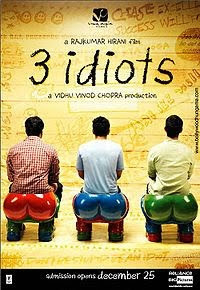 Last week me and Geeta went for a afternoon show of Three Idiots. Like other two movies of Rajkumar Hirani, This also touched our hearts. I cried a lot, laughed at few scenes and overall enjoyed the few hours at AUDI 4 at SPICE MALL, Noida with Geeta. During intermission we had large pack of popcorn. Few things in our life matched with the movie characters. Upasana switched to Post Graduation in Psychology after completing her graduation in Electronics. She is the only one in her class with no prior experience while all other students studied Psychology for 3 to 5 years (3 years in graduation and few students also studied Psychology in +2) and is rank holder. Geeta had gone thru a difficult phase in life and then she re-started her life with full energy. I lost every penny, did not give up and after a bad financial phase lasting for four years, again started earning profits.